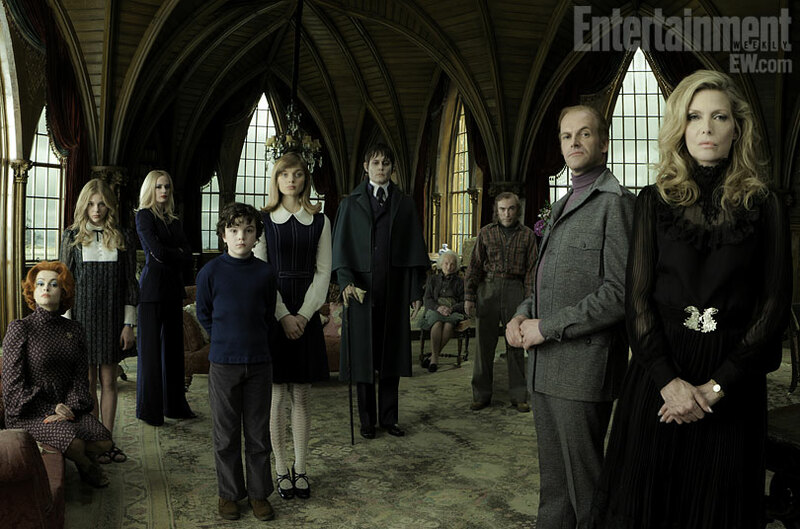 Entertainment Weekly have issued the first official cast photograph from the new Dark Shadows feature film, which is seen above. 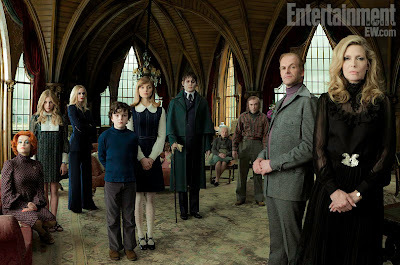 From left to right: Helena Bonham Carter (Dr. Julia Hoffman), Chloe Moretz (Carolyn Stoddard), Eva Green (Angelique Bouchard), Gulliver McGrath (David Collins), Bella Heathcote (Victoria Winters), Johnny Depp (Barnabas Collins), Ray Shirley (Mrs Johnson), Jackie Earle Haley (Willie Loomis), Jonny Lee Miller (Roger Collins) and Michelle Pfeiffer (Elizabeth Collins Stoddard). The picture is based on this classic cast portrait session from 1967. Says director Tim Burton: "For me, it captured the weird Dark Shadows vibe in a single image. I had a brief window of opportunity to have our cast present at the same time, the day before principal photography began. We decided to stage a similar picture instead of rehearsing, to see if we captured the Dark Shadows feeling." The piece also confirms that the character of Mrs Johnson will appear in the film, played by Ray Shirley. Collinwood's faithful maid has been reinvented slightly, as writer Seth Grahame-Smith explains: "Poor old Mrs Johnson... the mostly blind, mostly deaf maid who has been with them [the Collins family] for decades and decades." To read full profiles of all the characters with commentary from Tim Burton, Seth Grahame-Smith and producer Richard D. Zanuck, visit the Entertainment Weekly website. Adorei a maquiagem, as fotos !!! Johnny Depp ficou demais e hilario como sempre !!! Wow. Wow. Wow. So any doubts now that this will be an enormous treat for us DS fans. I THINK NOT! Wow! Awesome - thanks for brightening my day! Definitely feeling a lot better about the movie now! I think yea! I so cant wait. I want my shadows now. Oh. My. God. I knew who every one of those characters was as soon as I saw the picture! Oh far out, man! It's really happening - nice to see an official cast photo. I'm truly looking forward to this. Amazing!!! Helena is definitely channeling the late fabulous Grayson, I think we all spoke too soon! Depp looks incredible too!!! Now that's more like it! awesome photo. As I said before concerning the photo of Johnny Depp as Barnabas that looked strange, let's not jump to conclusions. That photo was completely out of context. This official cast ensemble photo certainly shows that "Dark Shadows" is in "excellent hands" with Tim Burton, Johnny Depp, et.al. NOW, I want to see this film. If this photo and the article is any indication, it should have that Gothic DS feeling. Feeling much better about this film. Fantastic! Thanks for relieving my anxieties about that former pic--this is gonna be absolutely Classic Shadows! I am just silly excited about this! I'm just sorry all the original cast isn't still with us so they could enjoy watching it with the rest of us. I think they'd be flattered by the caliber of actors who've been chosen to represent the roles they made their own. I didn't have any doubts, not for one minute! I mean, come on, this is Tim Burton we're talking about. How could I doubt him? Besides, Johnny and him love the soap opera too much to not make an excellent movie out of it. Every tidbit of info on the movie has been great so far. I am ready to buy my ticket! This is very comforting overall. However, "Angelique" in this pic looks much more like Carolyn from the orig. series than than the current Carolyn (Chloe) does. Must be the pantsuit and super-straight hair (and age). Especially good "matches" here with Hoffman, Barnabas and Roger. Willie looks a bit shabby, but he was probably portrayed a little too dapper (for a workman-servant) in the old show. Only thing that could have been better, a photo that had the original cast members that have been reported to be making a cameo apperance in the movie, along with the new cast. Getting there, a little at at time. It's looking good, love the fact that it takes place in the early 70's rather than today. Yes, the fact that it's set in the early 70s rather than today is definitely a good thing. I think that was part of the plan all along. I guess ideally (for me) it'd be set in '67 (when Barnabas originally appeared), but I'm not complaining. Everyone is so spot-on, even if Elizabeth and Victoria are blonds. It's looking like Maggie won't be appearing in the film. "No Maggie" makes sense in a certain way, even though I liked her (& her dad, and Joe). The original series started as Victoria's journey to discover things about her past & identity, and it later changed gears when Barnabas became so popular. In the '91 TV series, they reconciled these 2 themes by greatly diminishing Maggie's role (she wasn't much more than Roger's mistress) and having Vicky as the one who looked exactly like Josette (and thus who became the object of Barnabas' obsession).